When it comes to traditional recipes that are handed over by generations, there is always room for improvisation. A little variation of spices adds a distinct flavor. I have always tried to improvise on my recipes but make no compromise on the Kola Urundai &Kola Urundai kuzhambu. I sincerely follow Amma`s recipe to the `T`. 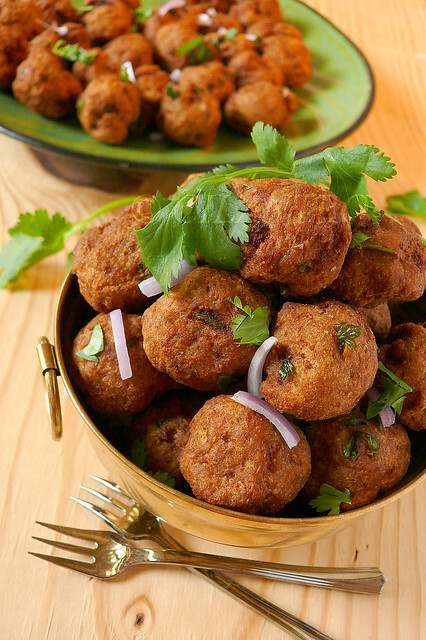 Kola Urundai is a deep fried meat ball made with minced goat meat/kheema which is blended with spices like cinnamon, cloves, ginger, garlic, curry leaves and cilantro. 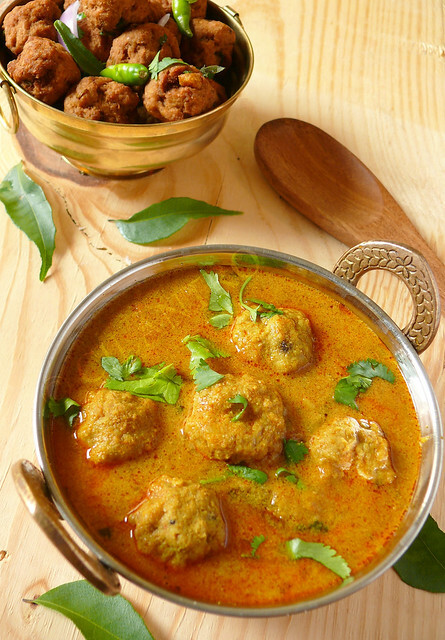 Kola Urundai Kuzhambu/Meat Balls curry~ a delicacy of the south, is prepared with Kola Urundai which are then cooked in a kuzhambu/kurma or curry. FYI:This is a repost of my previous recipe of Kola Urundai Kuzhambu. The last time I posted I did not give the procedure for the deep fried Kola Urundai and I have updated the pictures too. Instead of posting a separate recipe for the Urundai/ Balls, I thought I will club it together along with the Kuzhambu. Powder the split gram. Set aside. Grind the rest of the ingredients except the minced meat,curry leaves and cilantro into a fine paste without adding water. Transfer to a mixing bowl. Now add the meat and grind for few minutes in two batches. Transfer to the mixing bowl and add the powdered split gram, curry leaves, cilantro and salt. Make small lemon sized balls and keep aside. Heat oil in a kadai and carefully drop about 10 balls at a time into the hot oil. Now bring to medium flame and fry till done and it turns nice brown in color. Repeat till all the urundais are done. TIPS:Make only small lemon sized balls. 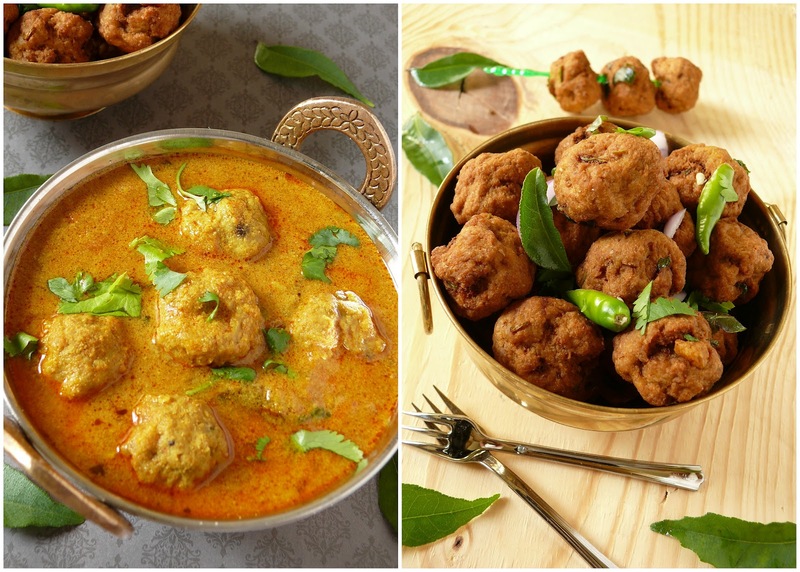 The mutton balls /Urundais may not get cooked if it is made too big. 1 kg of Mutton will yield about 75 balls in the size shown. 2 tomatoes or 1 cup chopped tomatoes. In a pressure cooker heat about 4 tablespoon oil. When hot add the onions and sauté well until soft. Then add the ginger, garlic paste. Sauté for another few minutes. Now add the chilli, dhania, turmeric powder and salt. Add the tomatoes and keep stirring for few minutes until the tomatoes are soft and the raw smell goes. Add two cups water and pressure cook to two whistles. When the pressure releases add four to five balls at a time, when it rises to the top of the kuzhambu put in another four. Repeat this until all the balls are done. To this add the coconut paste and bring to a boil and simmer for about 5 minutes. Squeeze a Lime before Serving. Serve with Rice, Chappati, Idlli, or Dosai. Tips: Another version is to deep fry the mutton balls /Urundais before adding to the gravy. I have used Thai green chilies in this recipe. Thanks for the recipe Cilantro, My mother makes them and this looks very similar to hers. I am drooling over it. I have had kola urundai but never had them in a gravy.nice recipe. Iam Really Sorry..I thought thats your name all these days.. I was googling for the recipe today and here it is. Nice recipe. Thank you Cilantro. How do you get the oil on top of the gravy like the ones in restaurant? Alka, I feel sorry for you. Hope your mom makes it soon for you. Pavithra, simmering for about 5 to 10 mts will make the oil separate. Cilantro, love the look of the curry. I have only heard about it, don't remember tasting it. Will make this very soon. very yummy,feel like eating it immediately,can it be done with chicken? looks very very delicious curry! !balls looks perfect in the curry....beautiful click dear! Drooling here,such a nice curry..the gravy looks super tempting. Looks so delicious...Thanks for the recipe, will try this weekend for party!!! My friend's mom dips the ball in beaten egg and fries it for crispiness...this balls will not be gud for making curry since it will not soak...try this way too.. I tried out this recipe today, with ground turkey though. It was delicious. Thank you for the wonderful recipe. I am drooling over it. Sai bhaji is second favourite dish for sindhis which is also served with rice. Sindhi kadhi is an easy to make dish which is prepared using gram flour.